We convinced Braun that we should get a dog and a little over a year ago we welcome Goldie into our home. Everything was perfect. She was housetrained super quick! She gives hugs likes nobody else. And, she sleeps all adorable with her favorite blanket in her mouth. Plus, she’s perfect. Did I mention that? And it’s at that point that everything went downhill. I thought “Man, this dog is sooo good. We should definitely get another one”. It was that thought right there that made me the proud owner of Pennie. And yes, we love her. We really do. But when someone continually poops and urinates in your home, that love is really tested! She is the sweetest, most rambunctious dog ever and brings awesome energy to our home. Where Goldie is calm and super snuggly, Pennie is a ball of energy. I felt like it was going to be super simple this time around. I just raised a puppy; I could do this again! But I discovered that all puppies are made differently. Just like kids, they come with their own personality, own set of rules, and they all obey at different levels. But we’ve survived. 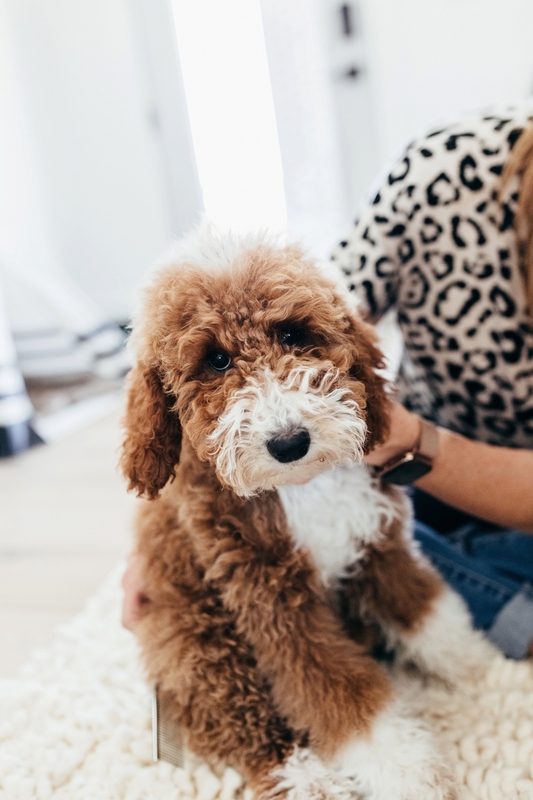 (I should say Pennie has survived because Braun has witnessed many of these pee puddles and it has been touch and go – haha). And in a few weeks, she’s off to a 5-week training camp, Wasatch Canine Camp in Orem Utah. (still trying to figure out why they don’t have these for children?) And it’s one of the best things we invested in with Goldie. It was soooooooo worth the investment! They broke all of her bad habits, finished potty training her and taught her all of the basics. I know that we would’ve been capable of handling that eventually but with our crazy schedules, I was more than willing to pay someone to do it quickly and effectively. So, while I don’t have potty training down (we will get there! 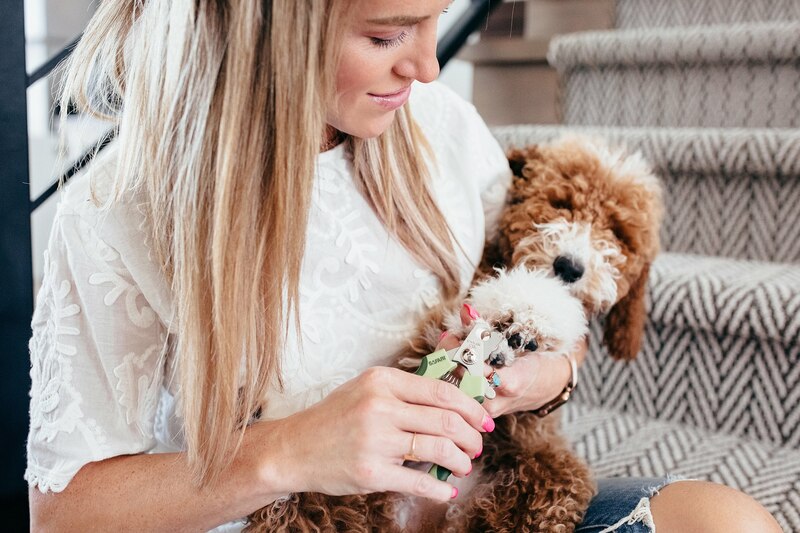 ), here are some of Pennie’s (and my) favorite puppy must-haves that make life with a new dog simpler! As you all know, the shower is Goldie’s favorite place to hang out! I wasn’t so lucky with Pennie but I’ll get her there! The last thing we want is a stinky dog running around the place! I already have 4 kids who fill that position! 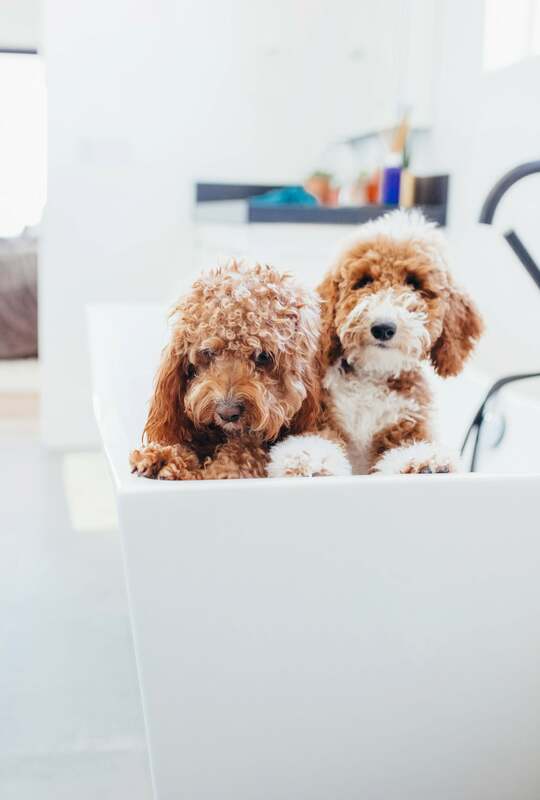 We got Goldie used to getting in the tub and shower right from when she was a teeny puppy and the same seems to be working with Pennie. She’s less reluctant around the water and bathtime isn’t the hassle it used to be. 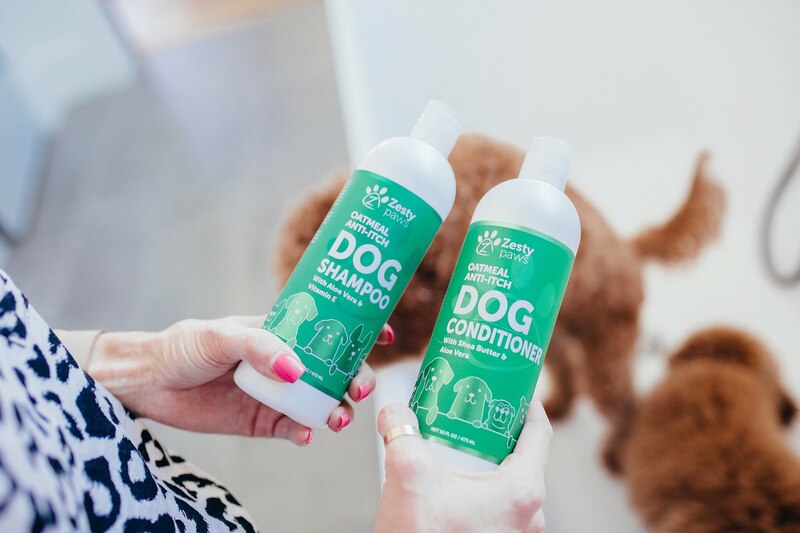 We recently switched both her and Goldie’s shampoo and conditioner and I’m loving this new stuff! I went a little crazy at chewy and looked for something more natural that would help moisturize and hydrate their skin. Goldie likes to get wet so often that I was worried about her coat and skin drying out! 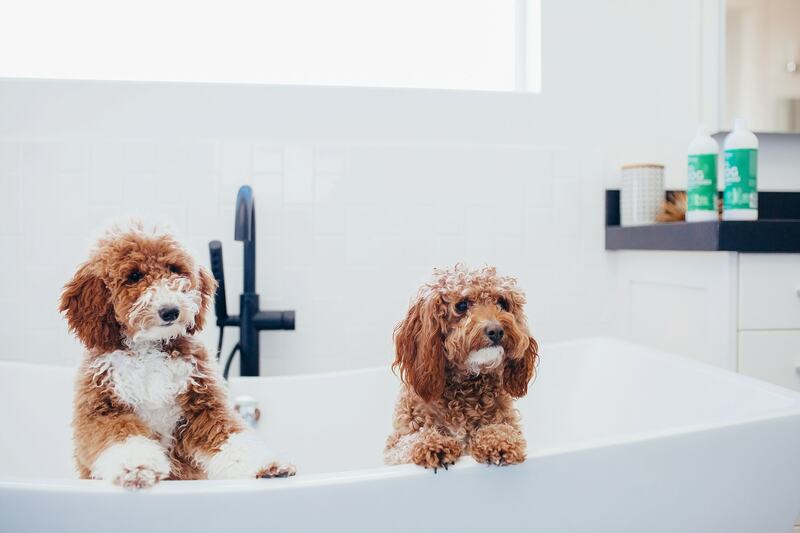 We keep both Pennie and Goldie fresh between washes with a dry shampoo that’s made just for dogs! We keep their hair soft and manageable by blowing them both dry and we love this comb! 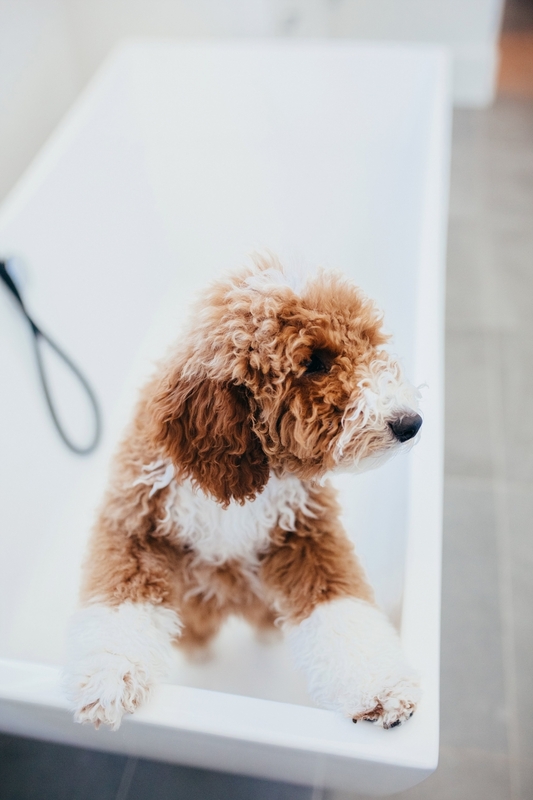 If you have dogs with curly hair or fur, blow-drying them is the best thing to keep those curls from matting! 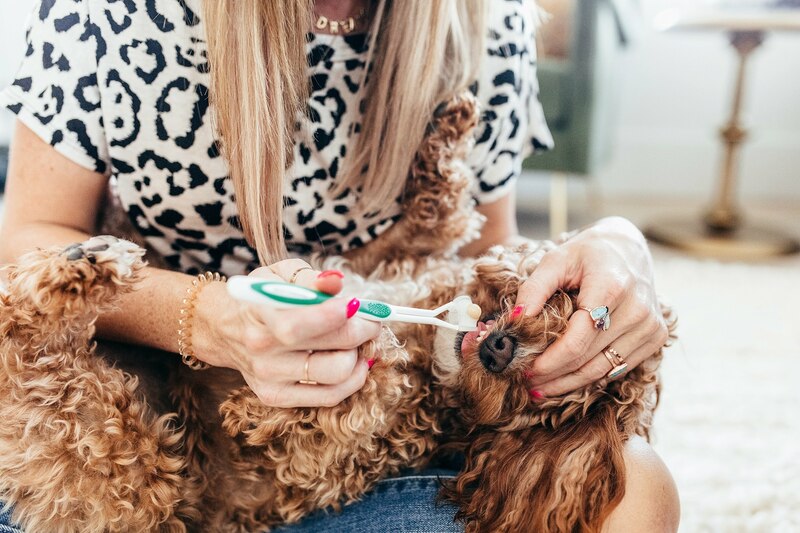 One thing I think is overlooked by a TON of dog owners is the tooth health of your dogs. Especially in smaller breeds. Their teeth seem to go bad quicker than a big dog because their food is different and it tends to stick. Living through my own abscess this past week has me doubling down on this tooth brushing! 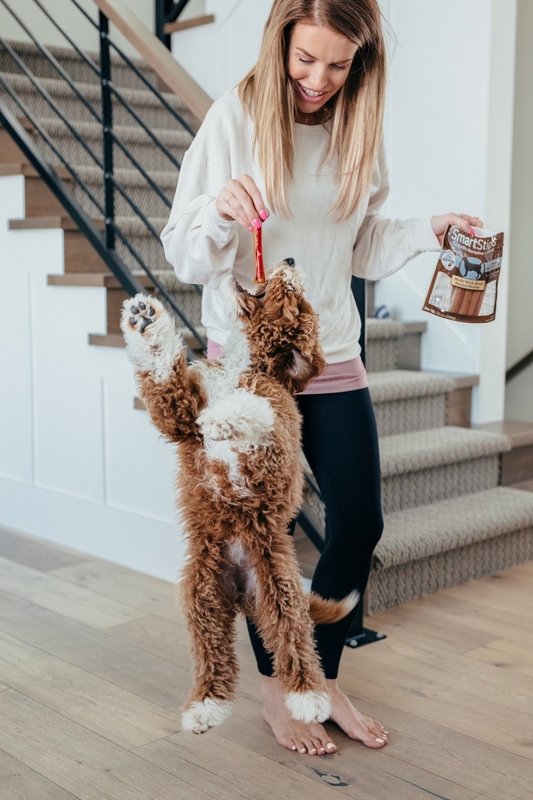 They have really great dog-safe toothpaste and the brushes are designed really well – they cover a lot of ground and get the job done! This specific toothpaste helps control plaque and fights bad breath with regular use. It has a tasty poultry flavor to ensure acceptance, and veterinary strength cleaning power. 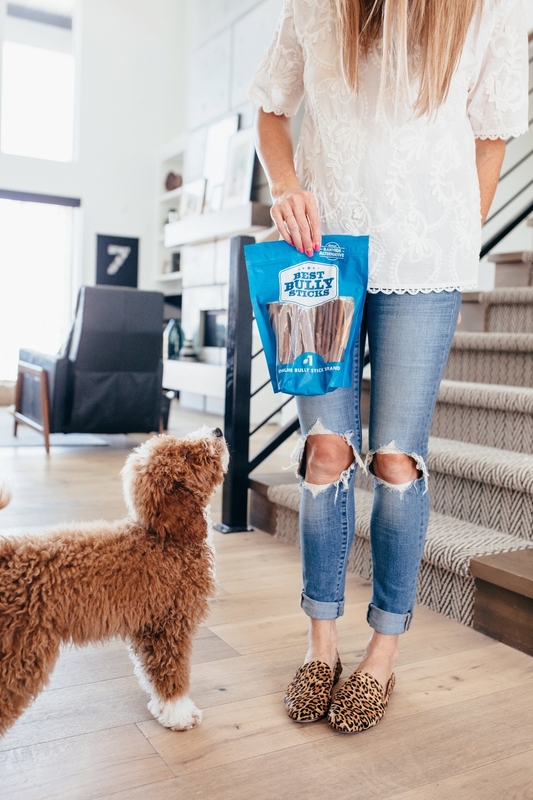 Bully sticks (even though I hate them) really help with keeping their teeth clean as well! Gross, but necessary! 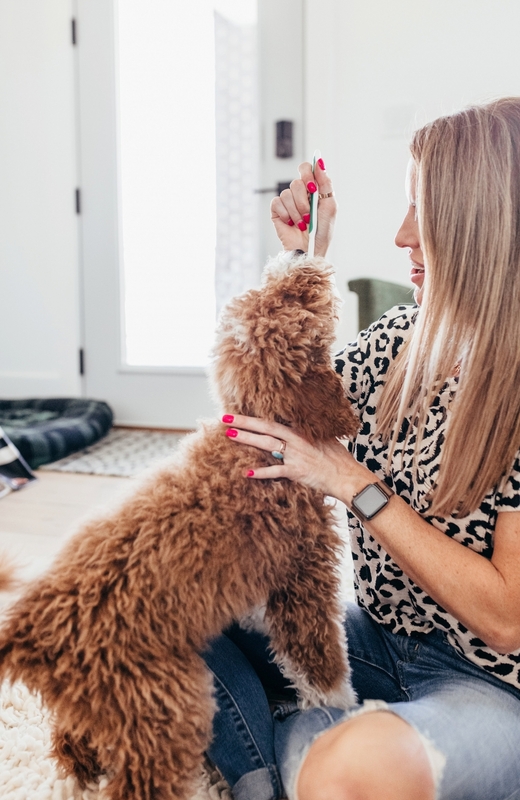 Unless your dog runs around on hard surfaces that help keep toenails short, you have to cut or clip them regularly — if you hear them clicking on a hard surface, it’s time for a trim. Like most dogs, my 2 aren’t fans! 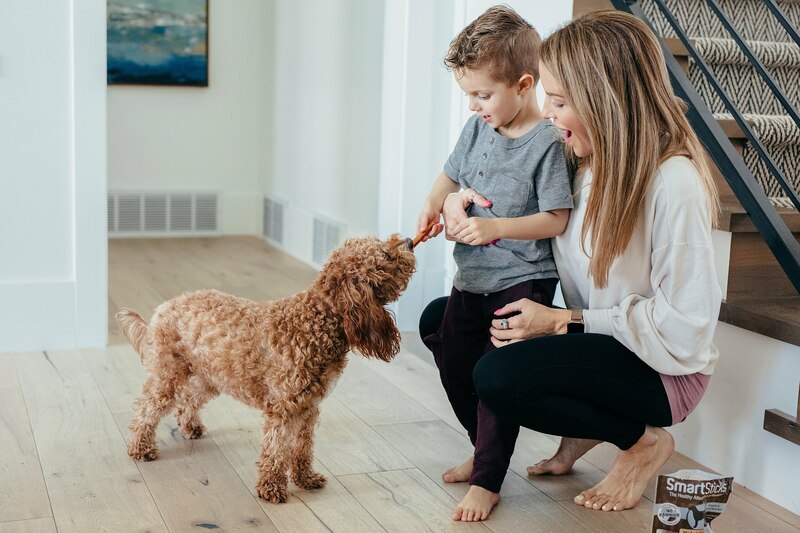 But getting your dog used to this ritual at an early stage helps you both weather the process without life-long scarring. 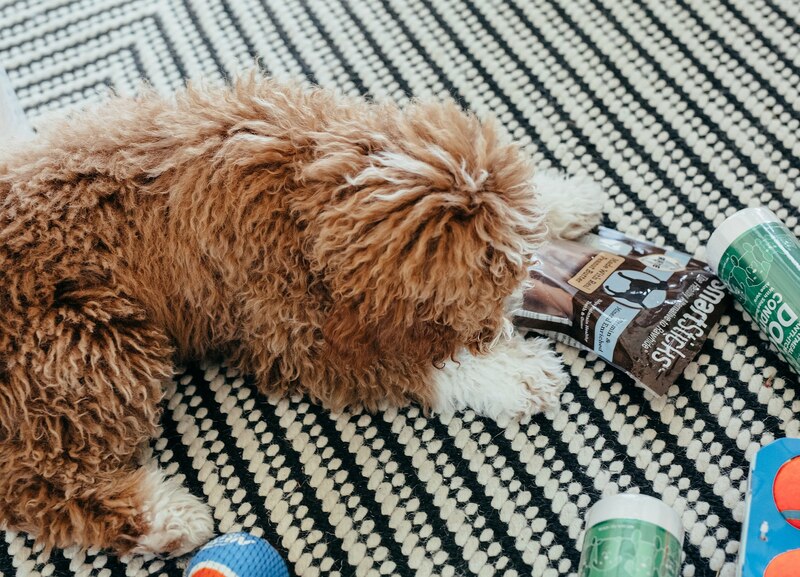 Try giving your dog a yummy treat after the trimming session and a big tummy scratch so they look forward to it. 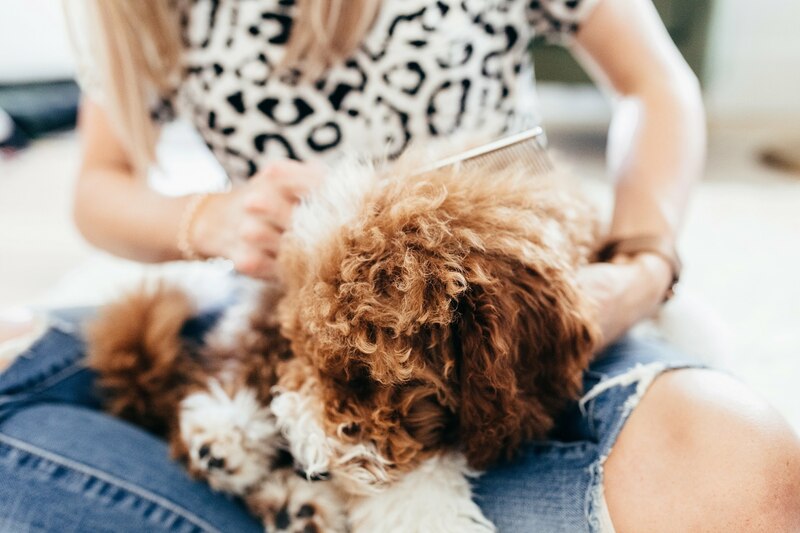 Check with your vet so they can show you the proper length your dog’s nails should be. Hold the foot steady, but hold it gently. Snip off a small bit of the end of each toenail. I love these clippers. 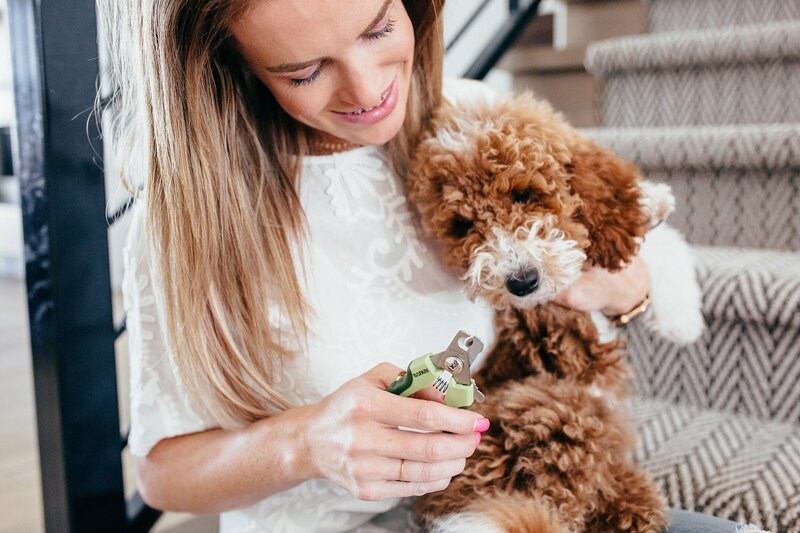 Place a tiny bit of the nail in the nail clipper and snip. If the nail feels spongy while you’re trying to cut it, stop immediately — you’re cutting the quick! If you cut the quick (often called quicking), you’ll have an unhappy dog and a bloody mess. That’s why you should go SLOWLY and only cut off small pieces at a time. If you’re unsure, clip to where you feel comfortable and then file to smooth out any rough edges. Quicking hurts a lot, and most dogs remember the experience long afterward. When it really comes down to it, Pennie is SO easy to please. She absolutely loves tennis balls or anything small and squeaky! We recently got a Nerf Gun Ball Thrower and this thing keeps her busy for hours! 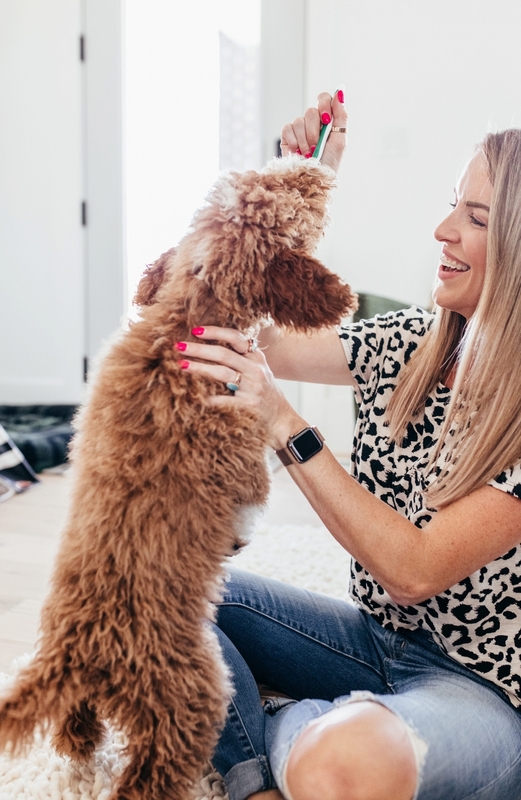 You can shop all of their favorite snacks, toys, and healthy chews (probiotics and flea medicine) below! You guys, this girl is crazy! She’s so much fun and we’re really looking forward to growing with her and seeing how her personality develops. A lot of you have asked where we got her bed, kennel, and our car seat guard and the truth is, we pretty much get everything at Chewy. I don’t love going to big box pet stores (the smell alone is enough to keep me out) and I’m a big fan of one-stop shopping. They have everything I need, plus you can save money by using Autoship for products you go through on the regular. 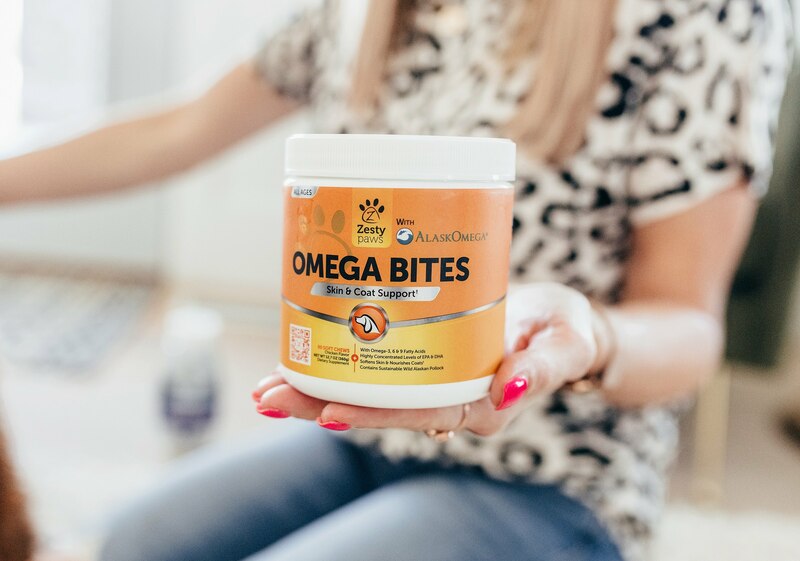 It’s a no-brainer for the basics! Autoship takes a to-do item off my plate by making sure your puppies get all their treats, food, etc. without requiring me to keep track of food levels, etc. As for how big she’ll get? Probably 30 – 35 lbs – I think there’s only a 5 lb difference between her and Goldie now! If there’s anything I missed check out the list below and if you have any questions about anything listed below or Pennie or Goldie in general, leave it in the comments below and I’ll answer it the best I can!